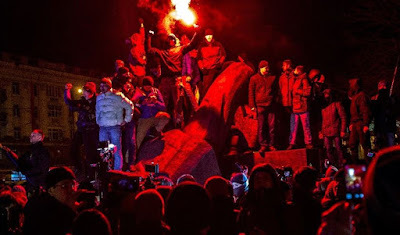 DNEPROPETROVSK, Ukraine -- Ukrainian activists in the eastern city of Dnipropetrovsk on Friday night toppled a statue of controversial Bolshevik leader Grigory Petrovsky, implicated in a famine that killed millions in the 1930s, city hall said. Ukrainian Nationalists after they toppled Petrovsky’s statue. Several young men toppled the 12-tonne bronze statue of Petrovsky — nicknamed “the butcher” for his role in the collectivisation of agriculture that led to a famine known as Holodomor — as they sung the Ukrainian national anthem, a YouTube video of the incident showed. Dnipropetrovsk, which is located near the pro-Russian separatist regions of Donetsk and Lugansk, was named after Petrovsky in the Soviet era and has since kept its name. The activists — prompted by a local lawmaker close to Filatov — sawed-off the monument from its pedestal before pulling it down, Interfax-Ukraine reported. “The statue is almost intact, it only lost its feet,” city hall said. The several police officers called to the scene stood by as the monument was taken down, Interfax reported. Ukraine’s Communist Party — which was banned by a Kiev court last month in the latest move to break from the country’s Soviet past — said the statue had been toppled by “neo-Nazi vandals” and called Petrovsky a “true citizen of Ukraine” who “addressed important public and social issues in the interest of the Ukrainian people”. Petrovsky, the de facto head of the Ukrainian Soviet Socialist Republic from 1922 to 1938, was also a signatory of the treaty that made Ukraine a Soviet republic. The Holodomor happened as Soviet police enforced the brutal policy of collectivising agriculture by requisitioning grain and other foodstuffs. Kiev recognises the Holodomor as a genocide while many Western historians say that Stalin’s regime orchestrated the famine to destroy Ukraine’s ambitions for independence. Russia has meanwhile contested this claim. The magnitude of the death toll remains hugely controversial among historians, with estimates of those who died in Ukraine ranging from five million to nine million.